Promoting educational achievement and innovation. Fostering stewardship, leadership and social justice. Since 1989, Kids Help Phone has been providing confidential, anonymous and professional counseling and information to young people five to 20 years old across Canada. No problem is too big or too small. Youth can call free anytime to speak to a counselor about an issue. Kids Help Phone does not subscribe to caller ID so that all contact is confidential. Young people can also access information or post a question to a counselor on-line at www.kidshelpphone.ca Kids Help Phone is a registered charity and receives no core government funding; however, it is supported by many individual contributors and corporate partners. Safety of students is the primary consideration when the decision is made to cancel buses because of drifting snow or icy roads. On occasions when dangerous travel results in school buildings being closed, students must not attend. However, when buses are cancelled but schools remain open, it is expected that parents will determine whether it is safe to send their children to school. It is also understood that, should they decide to bring their children to school, it is the responsibility of parents to deliver them and pick them up at the end of the day at the scheduled dismissal time. Students who arrive at school on days when the buses have been cancelled will be met by teachers who are prepared to provide instruction. If a majority of the class is present, the teacher will proceed with the planned program. However, on low attendance days, activities will be rescheduled and students will be given an opportunity to review material, practice previously learned skills or participate in other meaningful educational activities. For students who are unable to get to school when the buses are cancelled, work packages for home study are available on the Board’s website at www.st-clair.net Go to Parent Resources, then click on Home Study Activities. Exterior doors at all elementary schools will be locked during school hours. Doors will be unlocked during recess time only, to permit students access from the yard. Front doors of school buildings are equipped with cameras and a remote control locking and release mechanisms, to permit controlled access. Regular attendance and punctuality are important to ensure quality education for the student. It is also an excellent life skill that should be developed at a young age. The school office must be notified whenever a student is to be absent. In cases of dental or medical appointments during school hours, a note should be sent to the teacher indicating the time the student will be picked up and whether or not the student will be returning to school. If your child becomes ill, the office or the classroom teacher will call you at home. If there is no one at home we will attempt to call you at work. If we are unsuccessful, we will then telephone the emergency contact person whom you have designated. A sick student will not be permitted to go home alone. We recommend that a parent/guardian pick up the student at the school. The St. Clair Catholic District School Board believes that school volunteers are an important resource in supporting educational programs, and is committed to promoting and supporting the involvement of volunteers within our schools. The Board also recognizes the need to ensure the safety and well-being of all students. All volunteers who have regular contact with students must complete a Vulnerable Sector Criminal Background Check before commencing their duties. Anyone who is interested in becoming a volunteer should speak to the school principal. The Board recognizes that on occasion there may be the need for students to receive medication during the school day in order to enable education of the student to continue. In order for prescribed medication to be administered, parents/guardians must provide the necessary authorizations and school administrators must follow the guidelines as outlined in Sec. C Policy – Health Support. If injection medication is required, arrangements for the injections must be made by the parent or guardians. School personnel can assume no responsibility for injections (i.e. juvenile diabetes requiring mid-day insulin). Board personnel will not administer non-prescription drugs. The St. Clair Catholic District School Board recognizes the important role of computer technology in helping students to learn and communicate effectively. In keeping with its mission, the Board requires that all computers be used in a morally responsible and legal manner. Students and parents must be aware that some internet sites may contain material which is inappropriate, offensive, illegal or inaccurate. It is a privilege for students to access a school computer network and to receive an internet or email account. The person to whom the account is issued is responsible at all times for its use. All user accounts must be accessed solely to support the educational objectives of the St. Clair Catholic District School Board. 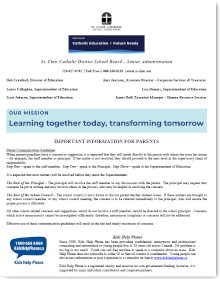 In April 2017, the St. Clair Catholic District School Board adopted a new Social Media and Electronic Communications policy and procedures. The new policy can be found on the Board website at http://www.st-clair.net/policies.aspx Look under Section B – Administration. The new policy has required a new consent form for release of student photographs, videos, classroom work, etc. for various publications, including Board websites or social media sites, school yearbooks, newspapers, television and radio newscasts. You will receive the new consent form this year from the school. Please sign the form and return it to the school, either granting or withholding consent. Once consent is obtained, it remains in effect for the student’s entire school career. However, if at any time for any reason parents/guardians wish to revoke consent, you are asked to please contact the school. The St. Clair Catholic District School Board and your school use the personal information you provide in accordance with the Municipal Freedom of Information and Protection of Privacy Act (MFIPPA). MFIPPA sets out guidelines which schools and district school boards must follow when collecting, using and/or disclosing students’ personal information. Under this Act, personal information refers to recorded information about an identifiable individual. Our families and staff enjoy opportunities to share activities with parents and the school community through teams, clubs, school performances and special events. Many of these are memory making for families; and as such, photos and videos are often recorded. We ask that families exercise discretion when taking photos and videos at school events; and consider the privacy of other students, who may also appear in those pictures. We ask that families not upload to the internet (i.e., YouTube, Facebook, etc.) images of students other than their own children. For more about Sec. B Policy and Procedures – Privacy visit the Board’s website at the link below. Schools are charged with the legal responsibility for maintaining and holding Ontario Student Records (OSR). These documents must not leave the school office. Parents may have access to these records; however, they are requested to speak with the principal to arrange a time when they can review the document together. In cases where custody is an issue, the parent will provide a copy of the court’s custodial order to be placed in the student’s OSR folder. If at any time, the information contained in the custodial order is changed, the parent will provide a copy of the new order. Religion is integrated within all aspects of the educational experience and that is one of the reasons we can say that Catholic schools are “schools with a difference.” Parents, priests and teachers prepare the children to receive the Sacraments. All children are encouraged to take part in all aspects of religious instruction and celebrations. We also encourage the children to attend Sunday Mass regularly with their parents, as the Mass is the very centre of our worship. Periodically, the teacher will send home information about the programs being used with ideas for parents/guardians to use with their child at home. We hope you will use these materials to make the spiritual development of your child a joint effort of Church, school and home. Students will attend school on scheduled school days and take holidays according to the school year calendar. In the event that parents choose to take their child out of school at times other than school holidays, the responsibility lies with the parent to provide opportunities for learning. Teachers cannot provide detailed daily homework assignments that replicate the missed school program. However, when students are away from school due to a prolonged illness or injury, arrangements will be made with the parents to provide support. The values evident in all aspects of a Catholic school should reflect the faith and Christian commitment of the school community. Popular social trends may be in conflict with the values taught in school; consequently, clothing popular at a particular time may clash with the school’s values and be unacceptable. All clothing worn must be clean, neat, free from slashes, comfortable and appropriate for the business of attending school. No clothing may be worn to school which has pictures, symbols or writing which may be interpreted as discriminatory, degrading, demeaning or disrespectful of Catholic educational values. For further information, please refer to Sec. C Policy – Dress Code for Elementary and Secondary Students. work in partnership with the school to support positive development. Step One – speak to the staff member; Step Two – speak to the Principal; Step Three – speak to the Superintendent of Education. The school standards of behaviour apply to all members of the school community, including students, parents and guardians, teachers or other school staff members, volunteers and visitors. in circumstances where engaging in an activity could have a negative impact on the school climate (e.g. on-line). be dressed in a neat and well-groomed manner, according to Sec. C Policy - Dress Code for Elementary and Secondary Students. prepare students for the full responsibility of citizenship. Through outreach, partnerships already in place may be enhanced and new partnerships with community-based service providers and members of the community (e.g., Aboriginal Elders) may also be created. Community-based service providers are resources that the St. Clair Catholic District School Board may use to deliver prevention or intervention programs. The police play an essential role in making our schools and communities safer. Police investigate incidents in accordance with a protocol developed with the Board. The protocol is based on a provincial model that was revised in 2011 by the Ministry of Community Safety and Correctional Services and the Ministry of Education. All students have the right to a caring, respectful and safe school environment, which is free from all forms of bullying and harassment. All school staff will take steps to prevent bullying and harassment and to assist and support students, who are being bulled. In order to promote positive pupil behaviours that contribute to safe learning environments, the school supports the use of positive practices for prevention and behaviour management. Progressive discipline is a non-punitive, whole school approach that uses a continuum of corrective and supportive interventions, supports and consequences to address inappropriate behaviour. When addressing inappropriate behaviour, school staff will consider the particular pupil and circumstances, including mitigating and other factors. A pupil may be suspended only once for any one incidence of an infraction and may be suspended for a minimum of one (1) school day and a maximum of twenty (20) school days. Further details, including the appeal process for suspensions and expulsions, are outlined in the St. Clair Catholic District School Board’s Sec. C Policy – Student Discipline.